This is the Mission Ridge Blend brought to you by Mela Coffee Roasting Company. 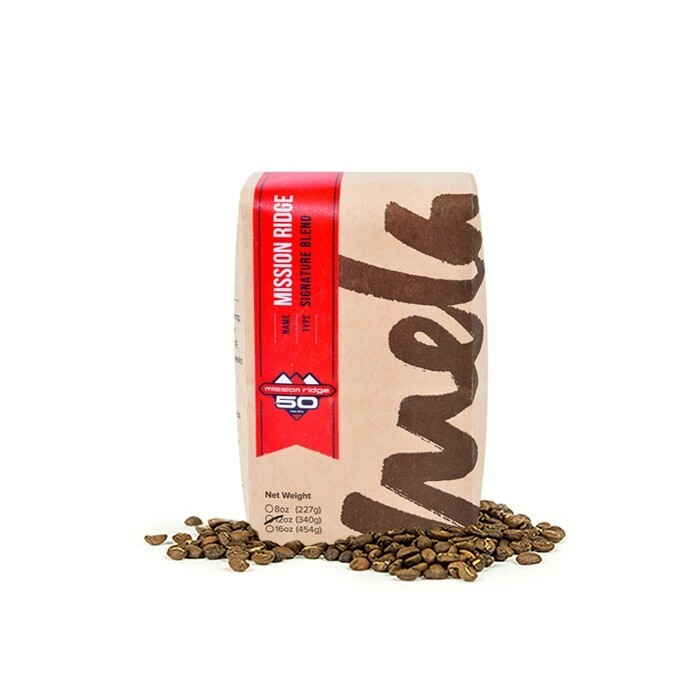 The Mission Ridge Blend features coffees from Costa Rica and Honduras. This signature blend has a roasty, bold profile with notes of caramelized sugar and chocolate in a rich cup. Enjoyable, maybe a bit darker than I like, but a good one. Great taste but not as much of a full bold taste as I was expecting. This was a solid coffee that was pretty good as an all day coffee. Worked well on all brewing methods. This was a great all around coffee. I brewed in my v60 but mostly via my espresso machine and can't go wrong with this. Love that it’s local but this should be classified as a dark roast. Drinkable but not complex or exciting. Smells amazing and great taste in the morning! Not terrible but not that good either. I mostly used it in my v60 and wasn’t a fan, but didn’t try it as an espresso. This was very bitter to my palate and I didn't like it hot, but it made a gorgeous cold brew! This brew did not have a lot of flavor. The roastyness seemed a bit too much and took away from the bold mouthfeel and caramel notes. Notes of dark chocolate. Tastes just okay. Too bitter for me. Pretty good. Liked the boldness of the brew. Was hoping for the carmel flavor to pull through just a little bit more. Nice morning coffee that is both smooth and bold. Nothing complex but quite satisfying when using an Aeropress. I will probably try this again at some future time. Nice flavor, nothing special, but not bad at all. Dark roast. Not a fan of that roasty flavor, which to me tastes like burnt coffee. Definitely prefer medium and light roasts. Delicious! Smooth and creamy and gone way too fast. Very oily, the grinds clump even if ground coarse making it hard to brew (either drip or french press). The flavor was very unremarkable, nearly bland. This is everything I want in a coffee, bold and full of flavor with notes of sweetness but not enough to overshadow the richness of the blend itself. Absolutely love this. The smoky, "roasty" floavors really took over the coffee for me. You had me caramelized sugar. You're gonna wanna V60 this. It is, as the stars indicate, EXCELLENT. A nice bold coffee, brews well with french press but better with espresso. Very little acid aftertaste. Smooth, but slightly sour. Liked it at the end of the first cup! Pretty bland, the bold profile was not noticeable. Not many flavors, tastes pretty bland like a generic dark roast. Not a bad blend. It's a little bland at the end....not much roastiness, but It does have good beginning notes of chocolate and sugar. All in all, a descent cup of coffee! Nice balance. The packaging was not air tight.